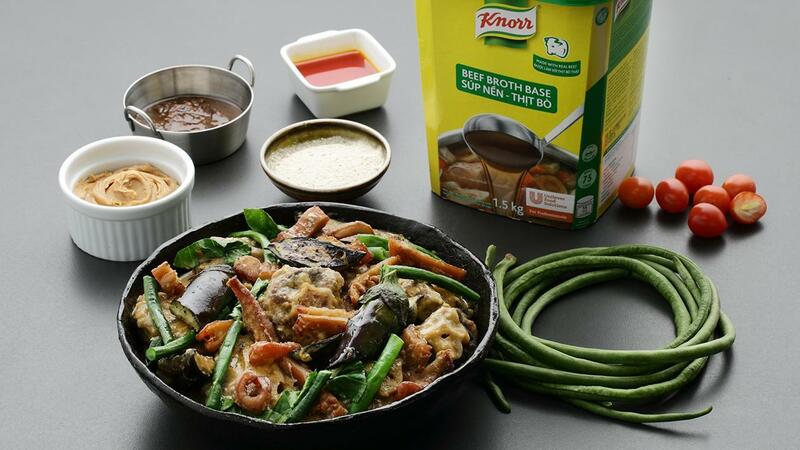 Try this new take on the classic Kare-Kare dish that Filipinos love! Combine all things together in a stock pot. Bring the mixture onto a boil then turn it down to simmer to tenderize the meat. Braising - 2 to 3 hours. After the meat is done, strain from the stock. Let the meat cool down. Remove excess fat from the stock. Reserve the stock to make the sauce. Braising - 3 to 4 hours. Pressure cooker - 1 hour. When the tripe is already tender, strain from the stock. Discard the stock. Add the peanut butter. Stir and let it slowly incorporate with the rest of the ingredients. Pour in the broth. Whisk to combine peanut butter with the broth. Whisk in the vinegar and the honey together in a stainless bowl. Season with Knorr Shrimp Powder, Knorr Lime Powder, and salt. Set aside until ready to use. Combine all the vegetables in a bowl. Toss with the bagoong dressing.